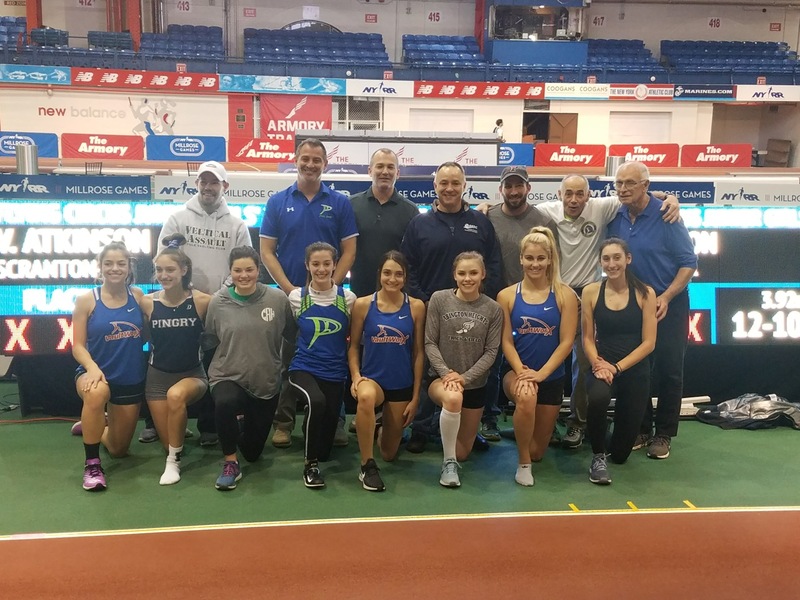 Hudson Valley Flying Circus | The 112th MILLROSE GAMES POLE VAULT FRIENDSHIP @ ARMORY!!!!! DANI HEINE 12′ 0″(3rd)…MARISA DiGIA 12′ 0″(5th) !!! The 112th MILLROSE GAMES POLE VAULT FRIENDSHIP @ ARMORY!!!!! DANI HEINE 12′ 0″(3rd)…MARISA DiGIA 12′ 0″(5th) !!! The NYRR MILLROSE GAMES FUN HAS BEGUN!!!! It was all about friendship at last night Flying Circus Girls Jr. Pole Vault Event at the …..”WORLD”S INDOOR TRACK MEET”. The stage was set at the Armory New balance Center for some good old magical pole vault flying for the 8 Rising Stars Girls at the 112th NYRR MILLROSE GAMES. CONGRATULATIONS to all athletes ..coaches and parents for night of pure athletics and sportsmanship. Five girls set new seasonal bests…. 3 new school records…. and a ton-of-fun was had by all !!!! MORE JR. POLE VAULT ACTION coming Saturday…Feb. 9 to NYRR MILLROSE!!! Stay tuned…. Our Elite Jr.Pole Vaulters take the center stage. Saturday morning at 11:45am… A stacked Boys Jr,Elite Pole Vault opens with Haze Farmer(AVC) 17′ 5″ PR and Rhett Nelson)AVC) 17′ 0″PR are top seeds….Flying Circus will have 3 athletes competing…… with Liam Landau(Pascack Hills,NJ) 15′ 9″…. Shane Racey(Ravena,NY) 15′ 6″PR and Conor Reilly(Scotch Plains,NJ) at 15′ 4″. Special International Youth star.. Carl Af Forsellers adds his 15′ 10 to the mix of 10 Jr. Stars. Saturday afternoon at 2:06pm… The Elite Jr. Girls Event opens with Top seeds Gennifer Hirata(Fredericks,VA) at 13′ 6″ this indoor and Edie Murray(AVC) at 13′ 6.5PR. Our Flying Circus Club will have Kaeli Thompson(Warwick,NY) 13’3.5″PR and Sydney Woods(Demarest,NJ) 13′ 1″PR chasing the next personal bars. Our Swedish friends Alva Sundlin(Stockholm,Sweden) at 13′ 1″ and Swedish team mate Sandra Alvern(Stockholm,Sweden) 13′ 2″ PR make this an International gathering!!!! NYRR Millrose Games,,,Thursday Night Girls Jr. Pole Vault Results.